Apoptosis is a process of programmed cell death, and apoptosis defect results in serious diseases such as cancer. Apoptosis induction is one of the key mechanisms of anti-cancer agents. This study was aimed to find anti-prostate cancer compounds from marine-derived fungus Microsporum sp. We found that physcion isolated from the fermentation broth extract of the marine fungus Microsporum sp. strain MFS-YL decreases the cell proliferation of PC3 human prostate cancer cells. Physcion induced cell apoptosis as determined by Annexin V/propidium iodide double staining. Physcion downregulated the anti-apopotoic proteins such as Ras, Bcl-xL, and Bcl-2, whereas upregulated the pro-apoptotic Bax. Physcion also activated caspase-3, caspase-8, and caspase-9. These results suggest that physcion from Microsporum sp. inhibits the proliferation of PC3 human prostate cancer cells via the pathway leading to apoptotic cell death. Physcion may be a potential candidate in the field of anticancer drug discovery against human prostate cancer. Cancer is a class of disease in which a group of cells display uncontrolled growth through division beyond normal limits. 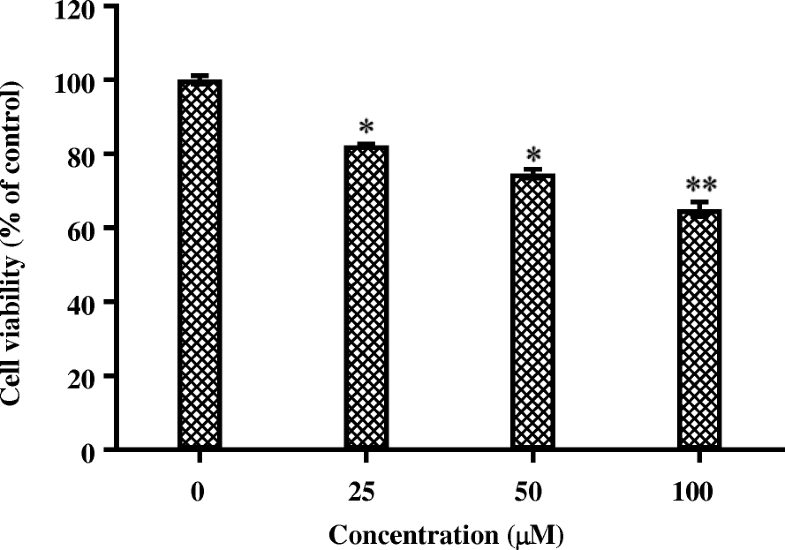 The proliferation inhibition and apoptosis induction of cancer cells have been used as a marker for evaluation of phytochemical anticancer activities Lowe and Lin 2000; Gurumuthy et al. 2001). Many potent natural products which display effective cytotoxic activity have been discovered in marine environment (Wijesekara and Kim 2010). The marine-derived fungi have been regarded as a fresh source of secondary metabolites with significant therapeutic potentials (Attaay and Zaborsky 1993; Li et al. 2003; Mayer and Gustafson 2003). Due to the unique ecological environment of the marine-derived fungi, the marine fungi produce novel chemical structures and diverse biological activities (Smetanina et al. 2007; Blunt et al. 2014). In the present study, as part of an effort to discover novel anti-prostate cancer compounds from marine organisms, we have investigated the bioactive constituents of the marine-derived fungus Microsporum sp. strain MFS-YL. Prostate cancer is a disease closely associated with uncontrolled cell growth. Most dangerous advanced prostate cancer cells are resistant to apoptotic cell death and do not well respond to cytotoxic chemotherapeutic agents (Feldman and Feldman 2001; Grossmann et al. 2001). Therefore, there is need for more effective agents that can induce apoptotic death of the cancer cells. We fractionated the fermentation broth extract of the Microsporum sp. MFS-YL by silica gel flash chromatography and purified by octadecyl-functionalized silica gel (ODS) column chromatography and high-performance liquid chromatography (HPLC). As that result, we isolated physcion demonstrating anti-proliferation activity against PC3 human advanced prostate cancer cells. Physcion is an anthraquinone derivative and has been reported to inhibit proliferation of colorectal cancer cells HCT116 and human breast cancer cells MDA-MB 231 through G0/G1 arrest (Hong et al. 2014; Chen et al. 2015). However, its anti-proliferation and apoptotic effect against prostate cancer cells has never been examined. In the present study, we investigated the anti-proliferative effect of physcion on human advanced cancer cell line, PC3, and its underlying mechanism. Our results show that physcion inhibits proliferation of human PC3 cells by apoptosis via caspase-dependent pathways. The fungal strain Microsporum sp. MFS-YL was isolated from the surface of marine red algae, Lomentaria catenata, collected at Guryongpo, Pohang, in the Republic of Korea. It was cultured in YPG medium (0.5% yeast extract, 0.5% peptone, 1% glucose, and 60% seawater) and stored in 10% glycerol with YPG medium at − 75 °C. The PC3 human prostate cancer cell line was obtained from the Korean Cell Line Bank (KCLB, Seoul, Korea). RPMI 1640 medium was purchased from Lonza (Walkersville, MD, USA), and penicillin/streptomycin and fetal bovine serum (FBS) were purchased from Gibco BRL, Life Technology (NY, USA). 3-(4,5-Dimethyl-2-yl)-2,5-diphenyltetrazolium bromide (MTT) reagent was purchased from Sigma-Aldrich (St. Louis, MO, USA). All antibodies Ras, PI3K, Bcl-xL, Bcl-2, Bax, caspase-3, caspase-8, caspase-9, and β-actin used for the western blot analysis were purchased from Santa Cruz Biotechnology Inc. (Santa Cruz Biotechnology, Inc., CA, USA). Other chemicals and reagents used were of analytical grade and commercially available. The fungus was cultured (20 L) at 25 °C pH 7.6 in YPG medium for 30 days and identified as the Microsporum sp. based on cellular fatty acid composition (gas chromatography) analysis (Korean Culture Center of Microorganisms, Seoul, Korea, similarity index 0.62). The fermentation culture broth was extracted (2.48 g) with ethyl acetate (EtOAc; 1:1.5 v/v, 1:1 v/v, broth-EtOAc) twice. The extract was fractionated by silica gel chromatography (n-hexane-EtOAc 100–0%, and CHCl3-methyl alcohol [MeOH] 1:1), ODS column (H2O-MeOH, 100–100%), and Sephadex LH-20 column chromatography (H2O-MeOH, 100–100%). Finally, high-performance liquid chromatography (HPLC) using a YMC ODS-A column (250 mm × 10 mm I.D., S-5 μm, 12 nm, MeOH) yielded the compound. The structure and molecular formula of the compound were ascertained from 1H, 13C NMR, and LREI-MS data. Human prostate cancer PC3 cells were cultured on RPMI 1640 media containing 10% FBS and 1% penicillin/streptomycin mixture and incubated at 37 °C under humidified atmosphere of 5% CO2. The anti-proliferative effect of isolated compound from Microsporum sp. on PC3 cells was analyzed using MTT assay. To estimate the anti-proliferative effect of the compound, the cells were seeded in a 96-well plate at a concentration of 5 × 104 cells/ml and incubated for 72 h. The cells were then exposed to different concentrations (0–100 μM) of the compound at 37 °C under humidified atmosphere of 5% CO2, after which, 100 μl MTT solution (1 mg/ml in DMSO) was added to each well and cells were incubated for another 4 h. Amount of formazan salt was determined by measuring the optical density (OD) at 550 nm wavelength by GENios® microplate reader (Tecan Austria GmbH, Austria). Relative cell viability was calculated compared to the non-treated control group. The data were expressed as means ± SD of at least three independent experiments. Apoptotic cells were observed using fluorescence isothiocyanate (FITC) Annexin V apoptosis detection kit (BD Biosciences) and flow cytometry. PC3 cells were cultured in 6-well plates at a density of 5 × 104 cells/ml. The medium was replenished when the cells reached 60% confluence. The cells were then treated with physcion (0, 25, and 50 μM) for 72 h. After incubation, trypsinized, floating, and adherent cells were pooled and centrifuged. Harvested cells were washed with PBS twice, mixed in 1× binding buffer, and incubated with Annexin V/PI double staining solution at room temperature (RT) for 20 min. The stained cells were analyzed by flow cytometry (FACSCalibur, BD Science, Heidelberg, Germany), and the percentage of apoptotic cells was calculated using Cell Quest software. Cell death was determined by fluorescent microscopy after staining cells with Hoechst 33342 as described by Naito et al. (1998). Cells were grown in 24-well plates at a density of 5 × 104 cells/ml. After 24 h, cells were treated with different concentrations of physcion and further incubated for 72 h. The media were then discarded, and the cells were washed with PBS twice and then fixed with a 4% formaldehyde solution in PBS for 1 h at RT. The fixed cells were washed again with PBS three times, and the cells were stained with 1 μg/ml of the fluorescent DNA-binding dye Hoechst 33342 and incubated for 1 h at RT to reveal nuclear condensation/aggregation. The Hoechst 33342-stained cells were visualized and photographed under a fluorescence microscope (Motic AE31, MHG-100B, Jed Pella Co., Redding, CA, USA; DM3000, Leica, Wetzlar, Germany). Western blotting was performed according to standard procedures. Briefly, cells were cultured at a density of 5 × 104 cells/ml in 6-well plates with serum-free medium. After incubation for 24 h, the cells were treated with different concentrations of physcion for 72 h. Cells were lysed in RIPA buffer at 4 °C for 30 min. Total proteins were extracted, and 100 μg/ml of protein was separated using on 12% sodium dodecyl sulfate-polyacrylamide gel electrophoresis and 5% stacking gels and transferred onto a polyvinylidene difluoride (PVDF) membrane (Millipore, Bedford, MA). The membrane was blocked for 1.5 h at room temperature using Tris-buffered saline and Tween 20 (TBS-T) buffer containing 0.1% Tween-20 and 5% skim milk. After washing the membrane with TBS-T twice, the blots were incubated for 1 h with suitable antibodies at 25 °C. The respective proteins were detected with a chemiluminescent ECL assay kit (PE Applied Biosystems) according to the manufacturer’s instructions. All the experiments were repeated at least three times. All results were expressed as the mean of three replicate determination and standard deviation (SD). The statistical significance of differences was analyzed by one-way ANOVA test using SPSS 17.0 (Chicago, IL, USA). To identify compounds with cytotoxic effect against human advanced prostate cancer cells from marine-derived Microsporum sp. (similarity index 0.62), some compounds (2.48 g) were purified from a pool of secondary metabolites. The chemical structure of an active compound (10 mg) was determined as physcion based on 1H, 13C NMR, and LREI-MS spectroscopic data (C16H12O5, MW 284), together with comparison with previously published data (Yang et al. 1999; Li et al. 2000; Guo et al. 2011) (Table 1 and Fig. 1). Physcion has been reported to inhibit the proliferation of human colorectal cancer cells HCT 116 and breast cancer cells MDA-MB 231 (Hong et al. 2014; Chen et al. 2015). However, no information is available regarding cytotoxic effects on human prostate cancer cells. Therefore, in the present study, we first examined the anti-proliferation effect of physcion on human prostate cancer PC3 cells. PC3 cells were treated with various concentrations (0 to 100 μM) of physcion, and the effect on cell viability was assessed by MTT assay. Figure 2 shows that physcion decreased cell viability in a dose-dependent manner. This suggests that physcion has anti-proliferative effects on PC3 cells. 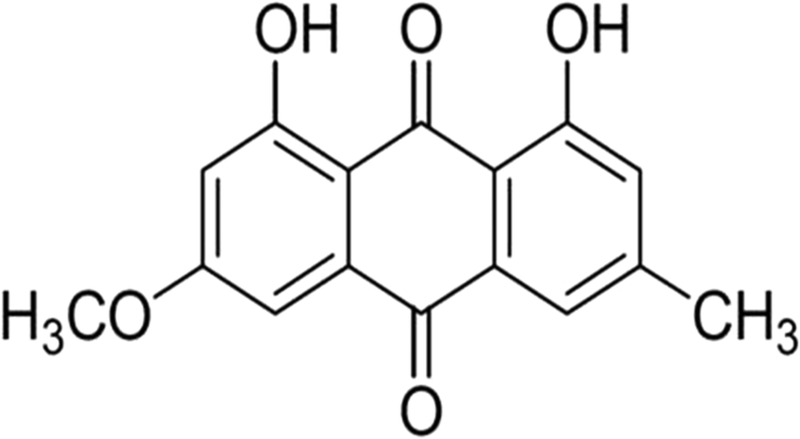 Chemical structure of physcion isolated from the marine-derived fungus Microsporum sp. To determine whether the anti-proliferation effect of physcion in PC3 cells is associated with apoptotic cell death, Annexin V/PI staining of PC3 cells was performed with flow cytometric analyses. PC3 cells were treated with different concentrations (0, 25, and 50 μM) of physcion for 72 h and double stained with Annexin V and PI (Fig. 3). FITC-Annexin V staining assay detects early-stage apoptosis before the cell loss by apoptotic cell death. PI staining indicates late-stage of apoptosis, since the damaged or dead cells are permeable to PI. Early-apoptotic cells (in the lower right, LR) are Annexin V-positive and PI-negative, whereas late-apoptotic cells (in the upper right, UR) are Annexin V-positive and PI-positive. Figure 3 shows the contour diagrams of Annexin V- and PI-stained PC3 cells by fluorescence-activated cell sorting (FACS) after 72 h of incubation with physcion. Under incubation with physcion, PC3 cells showed not only early-apoptosis phase in the LR quadrant but also late-apoptosis phase in the UR quadrant. These results indicate that physcion induces apoptosis of PC3 cells. Apoptotic effect of PC3 cells by physcion was also observed by the fluorescence imaging analysis of the cells with exposure to physcion. PC3 cells were stained with Hoechst 33258 for the nuclear imaging analysis of the apoptotic cells. Physcion induces nuclear morphological changes (Fig. 4). Late apoptotic cells with fragmented chromatin were also observed (arrows in Fig. 4). This result indicates that physcion induces a typical apoptotic cell death in PC3 cells. To evaluate the molecular mechanism involved in physcion-induced apoptosis of PC3 cells, we examined the effects of physcion on the activation levels of proteins that regulate cell apoptosis progression, including anti-apoptotic proteins: Ras, PI3K, Bcl-xL, and Bcl-2 as well as pro-apoptotic protein Bax. Physcion dose dependently decreased the expression of Ras, Bcl-xL, and Bcl-2 in PC3 cells, whereas the level of Bax increased (Fig. 5). This indicated that the anti-proliferative effect of physcion is mediated by downregulating anti-apoptotic signaling pathway involving Ras and Bcl-2 family as well as by upregulating pro-apoptotic signaling by Bax protein. Caspases play important roles in apoptosis (Stegh and Peter 2001). To investigate whether caspases are involved in physcion-induced apoptosis of PC3 cells, the protein level of caspase-3, caspase-8, and caspase-9 protein were examined by western blot analysis and quantified. Physcion treatment induced an increase in the expression levels of caspase-3, caspase-8, and caspase-9 (Fig. 6). The caspase-9-dependent pathway is specially involved in the physcion-induced apoptotic death of PC3 cells. Taken together, the results of this study suggest that physcion from marine fungus Microsporum sp. induces apoptosis in human prostate cancer PC3 cells by activating the caspase-3, caspase-8, and caspase-9 and regulating the signaling pathway involving the Ras/Bcl-2 family. Apoptosis is a programmed cell death (Hetz et al. 2005) and the ability to induce apoptosis has been known to be a promising strategy for cancer prevention and treatment, since apoptosis defects in cancer are associated with resistance to treatment using conventional chemotherapy. In particular, advanced prostate cancer cells become resistant to apoptosis and do not respond to conventional cytotoxic chemotherapeutic agents (Madan et al. 2011). Prostate cancer is common cancer in western countries’ men, and the prostate cancer incidence rate is increased in Asian countries because their eating patterns are changed into westernized eating habits (Kyprianou et al. 1996). Therefore, the agents that can induce apoptotic cell death in advanced prostate cancer cells will be very useful for prostate cancer treatment. Physcion has been reported to have cytotoxic effect against human colorectal cancer cells HCT116 and stop cell cycle progression of human breast cancer cells MDA-MB 231 at the G0/G1 phases (Hong et al. 2014; Chen et al. 2015). Physcion also induced apoptosis in human cervical carcinoma HeLa cells through ROS production (Wijesekara et al. 2014). Recently, Pang’s group found that physcion induces apoptosis and autophagy in human nasopharyngeal carcinoma cells CNE2 by targeting Sp1, which is mediated by ROS/mir-27a/ZBTB10 signaling (2016). Besides solid tumor, physcion has been also investigated on hematological malignancies (Liu et al. 2016; Elf et al. 2017). Physcion sensitizes human leukemia cells to antimalarial agent dihydroartemisinin (Elf et al. 2017) and to reverse multidrug resistance in human chronic myelogenous leukemia K562/AMD cells (Liu et al. 2016). Therefore, physcion may be able to target multiple molecules to exert anti-tumor effect in various cell types. However, physcion has been also reported to show no cytotoxicity against human non-small lung cancer NCI-H460 cells, melanoma A375-C5, and breast cancer MCF-7 cells (Almeida et al. 2010). Taken together, these findings suggest that the mechanism by which physcion induces apoptosis might be cell specific and related to activation of distinct signaling mediated by physcion. Physcion has never been yet studied on the prostate cancer cells. In this study, we showed that physcion isolated from marine fungal strain Microsporum sp. inhibits proliferation of PC3 cells in a concentration-dependent manner. Physcion inhibited proliferation of human PC3 cells by apoptosis via caspase-dependent mitochondrial pathways. Mitochondria-dependent apoptosis is an important pathway for apoptosis induction (Spierings et al. 2005). Anti-apoptotic proteins such as Bcl-2 and Bcl-xL control cell survival, whereas pro-apoptotic proteins such as Bax regulate apoptotic cell death. These expressions of Bcl-2 family are regulated by p53 tumor suppressor protein. The expression of p53 is controlled by upstream Ras and/or PI3K/Akt (Linke et al. 1997). Ras and/or PI3K/Akt activation inhibits apoptosis by inhibiting caspase activity. Caspases are a family of aspartate-specific cysteine proteases that serve as the primary mediators of apoptosis. Initiator caspases including caspase-8 and caspase-9 are involved in pro-apoptotic signals. Once activated, the caspases cleave and activate downstream effector caspases including caspase-3, which in turn achieve apoptosis by cleaving cellular proteins (Karran and Dyer 2001). In the present study, we found that physcion activated caspase-3, caspase-8, and caspase-9 and induced the downregulation of anti-apoptotic proteins, namely Ras, Bcl-xL, and Bcl-2 as well as the upregulation of pro-apoptotic protein, Bax. Taken together, these results suggest that physcion from Microsporum sp. inhibits the proliferation of PC3 human prostate cancer cells via the mitochondrial pathway, followed by downstream events leading to apoptotic cell death. A marine natural compound, physcion, could therefore be considered as a useful agent for treatment of human prostate cancer. Sun Joo Park and Se-Kwon Kim contributed equally to this work. This study was funded by a grant from the Pukyong National University (year 2017). YSD designed and carried out the experiments. WSK and SJP interpreted the results and wrote the manuscript. All authors read and approved the final manuscript.